Hello and welcome to another edition of The Fun Factor. Today we pay homage to an older deck, and see if it is possible to convert an older deck into a one with the cards we currently have available in the Standard format. The late nineties brought Magic the Gathering a huge power house of cards with the release of the Urza’s block. Tolarian Academy, Yawgmoth’s Bargain, Gaea’s Cradle Replenish, along with a few others made a major impact on the tournament scene at that time. Both Yawgmoth’s Bargain and Replenish slowly began to emerge in the dominant combo decks. Replenish along with Opalescence, and the support of Frantic Search and Attunement, became one of the decks to beat creating a lock down with Opposition. In the Standard environment however, the Replenish decks were weak. A Hybrid of Yawgmoth’s Bargain and Replenish was the only deck making any recognition at the time. Bill Whitlow was the only person to even post a top 8 deck in ‘99 States. Then a new set was released, Nemesis. Replenish would gain two more very strong cards to add to the mix, Parallax Wave and Parallax Tide. The addition of these two cards would ride Replenish decks to new heights. The deck would go on to win the German Nationals and place top 4 in the French Regionals. Major changes had to be made and fast. R&D had to make the choice to ban or restrict a majority of the cards that dominated the scene, not only in standard, but in other respected formats that these cards seemed to have a major impact in as well. Replenish, Yawgmoth’s Bargain, and Tolarian Academy, all ended up being banned or restricted. News Flash! 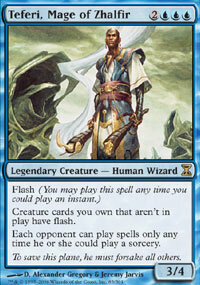 : Replenish is now unrestricted as of June 20th in the Legacy format. This is how the deck operated. By using its enablers such as Attunement and Frantic Search to unload enchantments into the graveyard, setting up for the Replenish. In the meantime it would establish control with Counterspells ,Parallax Wave, and Parallax Tide. to keep the opponent at bay. When the deck was set up, a Replenish would be cast, bringing all the enchantments into play. With the Opalescence in play, all your enchantments were now creatures with the continued use of the Parallax enchantments to control the board and attacking when possible. I myself happened to play a Replenish deck. In 1999 I played my best Swiss tournament ever. I went ten of the sixteen rounds before being eliminated. My synopsis of the deck was that it had to be played just right. It had a tendency to stall at the most inopportune moments, and then come back with a great wave (pun intended) of energy, swinging the whole game in your favor. Using your resources correctly was the ultimate challenge. Long gone are the control decks of Replenish in the standard environment. R&D has made it a point to bring us as much randomness to the tournament scene as possible by introducing cards that would give us a grand assortment of options for our decks. Dralnu, U/R/W Control, MGA as well as about seven other tier one decks have come out to be the metagame standard decks. Not to mention the numerous tier two decks being played today. Our current block has us gazing upon cards of the past, cards of an altered past, and cards of the future. Cards like Gaea's Blessing, Psionic Blast, Feldon's Cane, all make appearances from a pre-apocalyptic Dominaria. The alternate universe cards are cards from an altered story line, the Dominaria that never was. Crovax, Ascendant Hero, Mirri the Cursed and Essence Warden are all great examples of cards from an alternate reality. And finally we get a glimpse of the future with cards that feature new art and mechanics such as Arcanum Wings, Baru, Fist of Krosa, and Blade of the Sixth Pride. Are any of the cards from these sets able to bring us a new deck to emerge as a challenging deck that reflects the decks of the past? Is it even possible to imagine a replenish style deck in the current format? Today I am going to attempt to convince you that it is indeed possible to play a deck that reflects past deck strategies. Since Replenish is the main deck of my review, it will be my first deck that I will attempt and mimic. Before we can build a deck based on a passed deck or its strategy, we have to know what made it function. What were the core cards that made this deck work? I will do a side by side comparison of the original core cards, and then attempt to find an alternate current version that supports the duties of its original counterpart. First and foremost we have the star of the late nineties, the card that earned the deck its name, the card that was responsible for the tempo change. Replenish it self. The job of Replenish was to return all the enchantments from the grave yard to play. 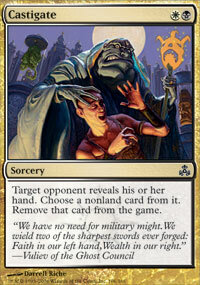 I think the most obvious answer for a replacement for this card would be its current counterpart, Retether. The difference in Retether. , is that it only returns Aura enchantments to play. The original Replenish deck did not have creatures, but relied on the combination of other enchantments being creatures via Opalescence,. So with that we will need creatures, but on to that subject in a minute. For now, Retether will suit our first choice of replacements. Next we need a dredging engine, a means to get cards into our graveyard. Replenish used Frantic Search and Attunement. Looking over our card pool we have a few options to choose from for our Frantic Search and Attunement slots. Cards that come to mind are Careful Consideration, Sift, Wistful Thinking, and Compulsive Research. My decision was to go with the Compulsive Research for the Frantic Search slot. Its casting cost was the lowest although I had to trade off the speed of an instant for the speed of a sorcery. If you’re willing to go with that extra one point of mana, then I would go with Careful Consideration as you can play it at the end of your opponents turn. Our replacement for the Attunement comes in the form of a creature. I am referring to Magus of the Bazaar. Now I will admit that it isn't as good as Attunement, but serves well. Attunement allowed us to draw three cards and discard four by returning it to our hands. Although Magus of the Bazaar is two cards to discard three, it stays in play, but it is more susceptible to creature hate. A plus, is that when an opponent sees it in play, they don't consider it much of a threat. From this point the strategy of building the deck skews from a card for a card exchange. Rather it becomes a strategy for a strategy exchange. Here is what I mean. Both Parallax Tide and Parallax Wave were used to disrupt the ability to cast spells and stop creatures from attacking. Although each enchantment had a specific duty, our card pool of today has a small host of cards that can do either or. Examples are Faith's Fetters, Gigadrowse, and Reality Acid to name a few. Finally we have the creatures. Unlike Replenish that didn’t run a creature base, e will actually have to have creatures in the deck. We will need creatures that will do double duty. Not only function as a creature, but do something else as well. Magus of the Bazaar already fits bill. The next creature that comes to mind is Riftwing Cloudskate. Not only is it a nice flyer but it bounces a permanent. It removes that pesky Worship that’s slowing you down or that Rack that’s causing you damage. 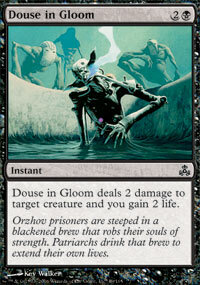 Another great creature card that serves double duty is Looter il-Kor. It attacks, evades, and serves our enabler engine of drawing a card and discarding a card. That’s three enablers! Replenish didn't have that! On to the enchantments. As we all know, enchantments have purpose, and that’s to give us a little bit of an edge in the playing field. The creatures we have are far from giving that massive beat down we desire. So we rely on the Auras to enhance those creatures. Since Retether only works on auras, we will need to pick some good auras that will boost our creatures giving them that competitive edge. The first analysis of our creatures, shows that they are weak, and in need of protection. The first aura that comes to mind is Shielding Plax. Shielding Plax will protect our creatures making them unable to be targeted. In addition, it will net you another card from its triggered draw ability. Double Duty! We will need a card that will help keep us alive. We have been steadily taking damage and we need to regain it quickly. Being that the theme of our deck works on auras, the best aura I see fit for the job is Spirit Link. Remember, gaining life doesn't win you the game, but it sure keeps you from loosing it. Multiple Spirit Links, equals more life. Now that our creature can gain us life, how are we going to get past the horde of creatures mounting up to block us? Infiltrator's Magemark. Now I know that the Riftwing Cloudskate and the Looter il-Kor already have an evasion tactic, but once in a while someone will have something to block it. Plus, if Magus of the Bazaar is still around, it will make a formidable threat when it has its enchantments on it. Another good enchantment for this deck is Auramancer's Guise. +2/+2 for each enchantment attached to it and vigilance just rocks this deck. I just wish I could see the physical expression on my opponents face when they are suddenly looking down on the face of a 17/17 Looter il-Kor with two Spirit Links on it. And remember that Magus of the Bazaar that seemed so harmless? Well now it has two Auramancer's Guise on it, and an Infiltrator's Magemark on it, making it a 13/14 that can only be blocked by creatures with defender. Just imagine the possibilities! discarding it as well. I feel at this point I am off to to a good start. Scale’s turn three had him playing a Stonecloaker returning his Coiling Oracle to his hand, and removing the Infiltrator's Magemark from my graveyard. He replays the Coiling Oracle again and reveals a Condemn. What an interesting combo, I think to myself. I was really expecting him to bounce the Looter il-Kor back to my hand. At this point I start to worry. A few more of the Stonecloakers and I could be wrecked. I need another Shielding Plax ASAP! On my draw I top deck a Retether and drop a Plains. I tap out to play the Retether, attaching the Auramancer's Guise and the Shielding Plax to the Looter il-Kor. I attack for 5 drawing a Spirit Link and discarding a Magus of the Bazaar. Scale plays another Oracle and reveals a land again putting it into play, then attacks. On my turn I enchant the Looter il-Kor with a Spirit Link and an Infiltrator's Magemark. attack for 10. 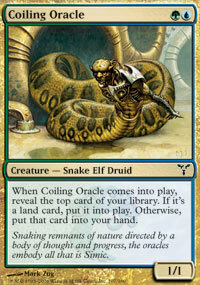 At the end of turn, Scale cast two Momentary Blinks on his Coiling Oracle in hopes to top deck something good. He attacks on his turn taking me to 13. I make one more attack and game was over. Good Game Scale. Scale feels he has what it takes to beat me and asks for a rematch. Thinking I can take him again, and being an honorable guild mate I accept his challenge and we belly up to the counter one more time for some virtual card slinging. I win the draw. My hand was amazingly good for this game, so I believe, because that’s about as far as I got. By turn two I suspend a Riftwing Cloudskate. Turn three had me playing the compulsive research discarding two Auramancer's Guises, but Scale had learned from the previous match. He played his Stonecloaker, bouncing his Coiling Oracle to his hand and then removing the first guise from the graveyard. Turn four I play a Riftwing Cloudskate and attack for two. He plays another Stonecloaker bouncing the Riftwing Cloudskate, and removing the other Auramancer's Guise from the graveyard. I play a Magus of the Bazaar, but it’s too late. By the time the combo gets going’ I am already at seven life. Scale easily puts me out of my misery. Good game. I decide it’s time for another opponent. My next opponent comes to the table with a B/W discard control deck. The die roll comes up in his favor, which I don't like with this deck. I prefer to have first go since it is a slow deck. Anyway, his first drop is a Plains and then he passes. I play a Plains as well. Turn two my opponent comes out of the gate slapping down a Swamp, tapping out for a Castigate. Ouch! A lump arises in my throat. I have a good hand and hope he doesn't remove the Auramancer's Guise I am holding. Instead he chooses the Riftwing Cloudskate. I continue to build my mana sources up by dropping another Plains and an (Azorious Signet). My opponent continues his pattern putting down Swamp number two and plays Psychotic Episode. This time its goodbye to the Auramancer's Guise that’s in my hand. I am starting to feel at this point as though he has this game in the bag. I play a (Island) and then a Looter il-Kor. My opponent is Swamp happy, dropping another and plays Aven Riftwatcher, gaining two points of life. I draw a Auramancer's Guise and enchant my Looter il-Kor. He’s Beefy! Here comes Papa! Bang! For three points landing a Compulsive Research in my hand and discarding a Plains. My opponent attacks with the Aven Riftwatcher, for two, then plays an Underworld Dreams. This could hurt, I am thinking. C’mon and Top Deck!. There it is! Spirit Link, which instantly goes onto the Looter il-Kor making him a 5/5. I suddenly feel the game favor shift to my side. Attack for five, gain five. I draw an (Island) from the Looter il-Kor'striggered ability and discard it. Next I cast the Compulsive Research discarding another Auramancer's Guise and another Looter il-Kor. I end the turn. My opponent has a big play this turn. He puts a Boros Signet into play and attacks again with the Aven Riftwatcher. Now at this point I am at sixteen and he at fourteen. I have been taking damage for each draw from the Underworld Dreams and his two attacks, but the Spirit Link has made up for some of the damage. Turn six I am sitting with a third Auramancer's Guise and a Spirit Link in hand after the draw. I play both of them and in response my opponent plays a Douse in Gloom which only nets him two more life bringing him to sixteen as well. Alas it wasn't enough for my tiny 1/1 Looter il-Kor which is now a massive 17/17. Good game. Riftwing Cloudskate and he hits me for 3 with an end of turn Fiery Temper. On his turn he plays a Seething Song to drop a Thrumming Stone. At the end of his turn I activate the ability of the creature hosed. I suspend a to discard Reality Acid and two of the Magus of the Bazaars. On my turn I play Looter il-Kor and Pass. Turn six and I think I should be dead playing a burn deck. My opponent suspends a Rift Bolt. End of turn activation of the Magus of the Bazaar’s ability and I discard a Spirit Link, Auramancer's Guise and Island. On my turn I attack with the Looter il-Kor to draw and discard Plains. I whole heatedly expect the Rift Bolt to target the Looter il-Kor, but to my surprise once again it targeted me. The ability of the Thrumming Stone triggers and he reveals a second Rift Bolt which also targets me. My life is now at eleven. Before his draw step however I try to put a wrench in the works and tap three of his Mountains with a Gigadrowse, leaving one open. That one was all he needed. A Rite of Flame is played, followed by Grapeshot, with a storm count of five. Four points target me and 1point targets my Looter il-Kor. It’s about time he killed the Looter il-Kor. My life is at seven. Magus of the Bazaar is activated and I discard Flickerform, Reality Acid and a Retether. On my turn the Riftwing Cloudskate comes into play. Its triggered ability returns the Thrumming Stone to his hand. I play a Retether making the Riftwing Cloudskate a 12/12, attack, gain twenty four life from two Spirit Links. My opponent replays the Thrumming Stone. I finish him with another attack from the Riftwing Cloudskate. My opponent for game five ate me for lunch. I win the roll and by turn two I have a Looter il-Kor on the field. I had no idea what he was playing, but the first two lands should of given it away. Two Dakmor Salvages. Oh well. I play a Spirit Link on the Looter il-Kor and attack. I draw an Infiltrator's Magemark and discard it. My opponent powers out a Shambling Shell. On my turn I enchant the Looter il-Kor with a Auramancer's Guise and he is now a 5/5. I attack and it brings me to 26 and discarding another Infiltrator's Magemark. My opponents turn four and he puts a Savra, Queen of Golgari. This is the moment in the game where it goes downhill for me. Of course he sacrifices the Shambling Shell to put a counter on the Savra, triggering its abilities, and me having to sacrifice the Looter il-Kor. Needless to say for the rest of the game I could not keep any creatures on the board and he finishes me on turn 9. Game six. I won the play but had to mulligan down to five cards. By turn two I get the Magus of the Bazaar out, and I feel I have the upper hand. My opponent by now has two Islands and a Forest . I am desperately activating the Magus of the Bazaar , but my draws are pulling mostly lands. I do manage to get a Guise, and Infiltrator's Magemark in the graveyard, but it’s not enough. I continue to take a beating from two Civic Wayfinders. On turn seven I attempt to play a Riftwing Cloudskate in hopes to bounce back an Elvish Piper he just put into play, but he counters it with a Delay. The end of my turn he drops a Teferi, Mage of Zhalfir and then a Tidespout Tyrant, returning Plains to my hand. My opponent’s turn eight, he manages to return another Plains and an Island. I am at ten and he attacks with everything, thus ending the game. Now if you remember, I stated in my first article that my articles are going to focus on fun and casual play. With that in mind I take my deck into the Multi player room. Multi player has a different feel. Players are less aggressive until they have their combo lined up. With this advantage, I was able to buy time and set up as well. Needless to say of the four Two Headed Giant games I played, I won three of them for my team and only lost the fourth because my teammate conceded leaving me to fend for myself. Now I am not going to detail the Multi player games, for that would take too much time, but I will say the deck performs a little better because of the less aggressive nature of the Multi player game in the first four to six turns. My conclusion on the deck. I like the deck. It brings me fond memories of the old Replenish deck. After it was built, I was able to play it as though I have been playing it for years. If you played Replenish, you will have no problems assembling this deck and playing it yourself. As I stated about its ancestor, the Retether deck seems to rely on close to perfect draws to get going. A clump of land draws, or no sign of a Retether, you are out to dry in a heartbeat. The deck could probably use some tweaking. As I stated in my last article though, I am by far not the best at making decks that are efficient. I focus more on fun the rogue style of play. I am willing to bet someone will suggest some better cards in the comments. I actually encourage you to do so. Do I feel this could be a tourney worthy deck? No. You might get lucky and make it a few rounds, but don't expect to go to the top 8. Finally I want to thank all of you who have provided both positive and negative feedback on my last article. I try to take negative feedback in a positive way. Sounds odd huh? Negative feedback is meant to be a learning tool. And that is what I am doing, learning. Until Next time, Be kind to your fellow players, and remember to have fun. No, I didn't realize it returned only your creatures. I could os sworn it said a creature. Thanks for pointing it out. Copy enchantment seems fun, but rether wouldn't touch it. It'd have to be hardcast and the enchantment its copying already in play. I usually don't have a problem with the coronets, they work fine, especially with the unstable mutations. I tried out the riftwings, but prefer the flying men. The auratouched mage got cut right away, and i'm trying akroma, angel of wrath and Grand Arbiter Augustin IV. I'm also looking at blazing archon and followed footsteps. The mana base I tweaked... I cut an adarkar waste, 2 terramorphics, 1 plain, 1 island, 1 new benalia, and 1 tolaria west, to add 4 flagstones of trokair and 4 hallowed fountain. The rest of the deck is minus the mage and plus 2 grand arbiters and a followed footsteps, which gets fun fast, but a little to slow for my tastes. More testing will tell. Any more ideas anyone? A fun, and usually, budget deck, try it! Thanks again Lythand, was definately on the back burner 'til this..
On two occasions, you make it sound like Stonecloaker can bounce opponents' creatures. If it was just once, I would have thought its a typo. You do realize, it only bounces a creature "you control", right? When i wrote the article, I had this deck list. I tested it a few times and then submitted it to a fellow clan mate for editting. However that clan mate had been busy and never got to me. I did some cahnges to the deck and more testing. My inexperiences in article writing, forgot to change the original deck list. Here is the updated. I have always been a skeptical one on running 1 ofs. I may try it though. See how it performs. A few of them though are needed as four offs. Auramancers Guise and Spirit link are the main ones. Riftwing and the Faiths fetters are there for dealing with spot annoyances. And yes there are some changes like dual lands that could be added. But I was working this with a bidget. Fianlly, I did test the deck with Daybreak coranet. Problem is, when you cast retether, and if you have no enchantsments out on any creatures yet, it will stay in the Graveyard for lack of legal target. One of my favourite fun decks to play at the moment is Zur, with planty of enchantments including the magemarks, once he's out it becomes real fun chosing just which encjhantment to grab for maximum effect, not winning effect, but fun effect. I just put in a retether when I drew one, but unlike you seck I don't get enough enchantments into the GY to be much use. I'll give yours a go and let you know how it plays out. Thanks, good article. What about Copy Enchantment? You could cut of the 4-ofs to be more flexible by using the CE. It even triggers comes into play, so will get the 4 life from Fetters or draw the card from Plax. You could have taken some of the spirits of the old list by adding Three Dreams as an ersatz-Enlightened Tutor and instead of playing a lot of unsorted 2-ofs use a bunch of 1-ofs. This way, up the number of Signets to 4. To add some structure play 4 of the Research - it's gold! Last but not least, what is your plan against spot-removal? I just gotta sugest daybreak coronet, I think it could easily replace the flickerform. I don't know about you, but in my testing I tried flickerform and never once used it, got cut after only a few games. Maybe even replace the spirit link, but not sure. I also ran flying men over riftwing, and unstable mutations over gigadrowse, reading your article it doesn't sound like it did too good, love 'em in mine. Shielding plax is a good idea, didn't think of it in mine. 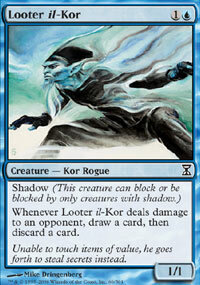 I love looter il-kor, he's in half my blue decks. Land base could definately be tweaked, but its probably all to do with budget, not that expensive of a deck. Don't know why you run so much white mana though, I understand you need it for retether, and occasionally ther other auras, but nowhere as much. I remember when urzas block was around, by far the most powerful block to see print. A really good article though, thanks. Overall, very good effort. I liked the brief history lesson and trying to bring that deck into todays standard. I hope this article recieves better approval then the last. Hello, I just joined and will be participating soon. I have had some terrible teeth whitening experiences I would like to share...I finally found something that worked but the first few products I used were terrible. Let me read a few posts then I'll be back to share.